Edmonton winters are not always the friendliest, which makes your car’s heater all the more important. If you get in your vehicle to find that the heater is only blowing cold air, not only will you continue to freeze on your drive, but your defrosters won’t be able to work which creates a potential driving hazard. Much like your home furnace, your car’s heating system is made up of many parts working together. If even just one of these parts isn’t working correctly, it can cause the whole system to fail. Before you give up hope, check out these common troubleshooting tips for car heaters to see if you can identify the problem. Coolant is a mixture of antifreeze and water that is used to cool the engine down. During the winter, coolant is brought over from the engine to the heater core which then blows warm air into the car’s cabin. The air will feel cool for the first few minutes while the engine is warming up, but if you’re noticing that the air never warms up the first thing you’ll want to check is your coolant level. If your car is low on coolant, it won’t be able to send any to the heater core to create warm air. If you’re low on coolant, you can add more to the system; however, if you’re noticing that your coolant levels are consistently dropping, you may have a larger issue and should book an appointment with your auto repair shop. Water leaks are another common reason why a vehicle’s heater stops working. There are a lot of places where leaks can occur, so be sure to check your hoses, radiator and water pump for damage. The easiest way to detect a leak is to notice liquid under your vehicle when you leave your driveway or garage. In winter, this can be harder to diagnose due to melting snow, so these problems can often go unnoticed until it’s too late. After years of consistent use, the heater control buttons can clog up and stop working. 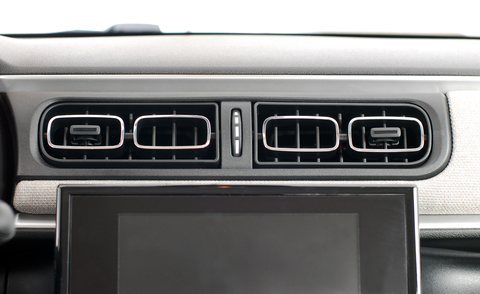 The heater control valve is underneath the hood of your car and acts as a switch that turns the heat on and off. If it’s gummed up, it’s possible for it to get stuck blowing cool air. Consider replacing the control buttons or your heater control valve. Your car’s thermostat opens and closes the circuits in the cooling system as the engine warms up. If you notice that your thermostat is always stuck on “C” even after the engine has had time to warm up, your thermostat may be broken. A broken thermostat can’t signal to the car that the engine is warm, so no coolant will be sent over to provide heat. The good news is that getting a new thermostat installed is a quick and relatively inexpensive fix. Edmonton winters are much more enjoyable when you are warm and cozy in your vehicle. If you’re having issues with your car’s heater, contact the team at Park Muffler to schedule an appointment today.